Minimalism. I’ll always remember fondly as a young teenager reading about Italian designer Miuccia Prada. This was the nineties and monastic dressing was the new style as a response to the over-the-top maximalism of the eighties. The sartorial world pronounced Ms. Prada’s designs not only the height of fashion, but her position as the reigning queen. Now, well into my thirties I am just as enamored with clean crisp lines today as I was then. Sparse silhouettes are welcome in accessories as well. 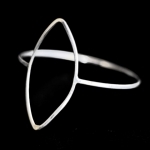 One local jewelry line who embodies this aesthetic is Limbo Jewelry Design. 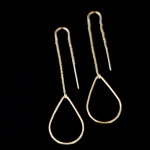 Husband and wife team Edson Enriquez and Ann Rutt-Enriquez founded Limbo Jewelry Design in 2005. As the creative director, Mr. Enriquez has a clear love for architecture which translates into playful use of shapes in the jewelry. I’m particularly fond of the lariat necklaces, a staple for each season; you wear the necklace by threading one of the shapes through the other. 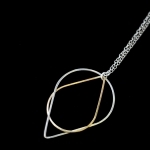 It not only creates a striking effect, but highlights how you can personalize the necklace and make it your own. Please join me Thursday March 21st at 6:30pm for my first style talk of the season! Limbo Jewelry Design is celebrating the opening of their new South Congress location in Austin, Texas… For more information, please go here. Enter your email to receive it today.